Shaanxi Province is one of China's ... central Provinces lying in the upper North-East of the country, adjacent and west of Hebei Province with the National Capital Beijing. Neighboring Provinces are in clockwise direction - Gansu Province and Ningxia Province in the West, in the North the Inner Mongolia Autonomous Region (AR), ,to the East Shanxi Province and to the South and East Henan Province. Finally, Hubei Province in the South-East, ChongQing Province in the extreme South and Sichuan Province to the South and West close the list. The Topography of Shaanxi Province can general be seen as follows - In the North and North-West a Ring of Mountains encloses ..... Most of the North is Mountainous or Hilly. 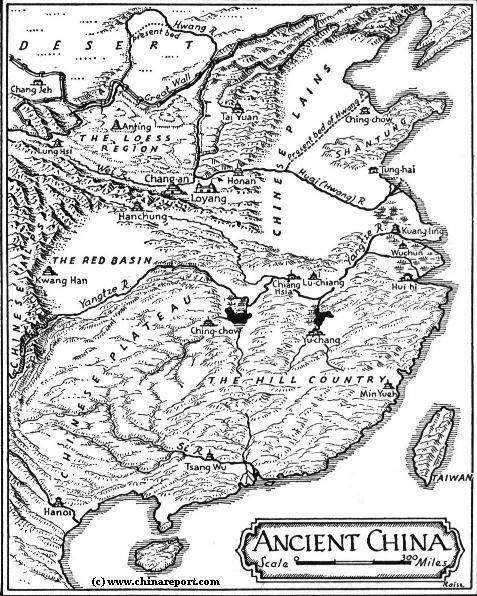 In the South the situation is the complete opposite, where the North China Plain leads down south into the fertile central and coastal provinces. Other notable features are the dry and arid conditions in the West, owing to the encroaching of the Gobi Desert and the loess-deposits of yellow dust blown in from the Gobi and the Yellow River Basin (in Shanxi, Shaanxi, Ningxia, Inner Mongolia and Gansu). Main Rivers in Shaanxi Province are the Yellow River (Huang He) and the Wei River. 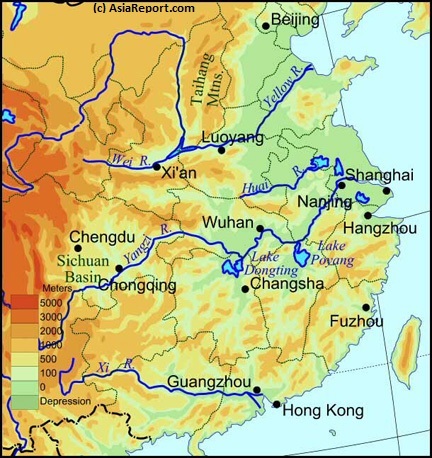 The main thing for travelers to remember is that the Yellow River delineates the eastern border of northern Shaanxi Province, whereas the fertile Wei River runs from west to east, leading past the ancient Cpital of Xian, dividing the Province in its (roughly) northern and southern halves; the Shanbei and the Shannan regions. Naturally, there are a multitude of smaller rivers and many streams to flow in Shaanxi Province. In the more arid Shanbei region which includes much of the loess plateaux and the Mu Us Desert, these are the Yuxi River (Yuxi He) which also flows through the city of Yulin, the Wuding River (Wuding He), Xiaoli River (Xiaoli Cun), the Xichuan River which flows through Yan'An the revolutionary Capital, and others. Although the statistics from the Central Government expressly mentions that there are a total of 54 minorities to be found within Shaanxi Province, in reality the Han Nationality accounts for 99.5% of the total population while the minories account for only 0.5%. In other words, there are members of 54 minorities present in the province but there are no larger communities of ethnic groups to be found within this Province of China (P.R.C.). 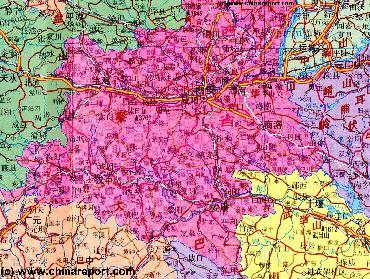 As Government sources note: the minorities are widely scattered and mainly live in the Guangzhong plain in the central part of the Province. To be more exact, the number of minority citizens in Xi’an, Baoji, Xianyang, Tongchuan, Weinan and Yangling Demonstration Area (roughly the Wei River Valley) account for 71.53% of the total minority population of Shaanxi Province. The number of minorities in Qinba Mountainous Region of south Shaanxi (Shanbei Region) is slightly lower than that in the Wei River valley and Guanzhong plain. The minority population in the southern cities of Hanzhong, Ankang and Shangluo account for 26.55% of the total number of minorities of the province. The minority population of Yan’an City and Yulin City in north Shaanxi accounts for 1.92% of the total. The main ethnic minority group to be encountered while traveling in Shaanxi Province are the Hui minority, as they are among the most easily recognizable with their typical Hui hats and the more colorful prayer hats used when visiting the mosque. Others registered are the Mongolians and the Manchu. Due to the scattering of minority members acoss the Province and the lack of ethnic enclaves a visit to a minority community is not among the main charms of the tourist itenerary in Shaanxi Province.One main jewel of ethnic culture may however be found in the Capital of Xian, where a large quarter of the old walled city centering on the Grand Mosque of Xian is considered the realm of Hui Muslims. Found smack in the center of the old city, a visit to the "Muslim Quarter" of Xi’an is a must for any tourist visiting the provincial Capital. 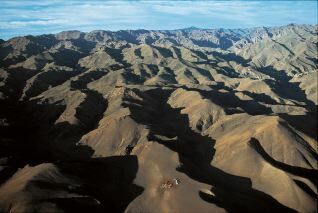 The dry dust blown mountains of the loess plateaux extend across northern Shaanxi Province, much of Shanxi Province and parts of Inner Mongolia AR and Western Hebei Province. Full Introduction to Shaanxi Province - Coming Soon !! Soundbonus - Traditional Chinese Folk Song "The Love of the Wei River", performance on Pipa by Liu Fang. 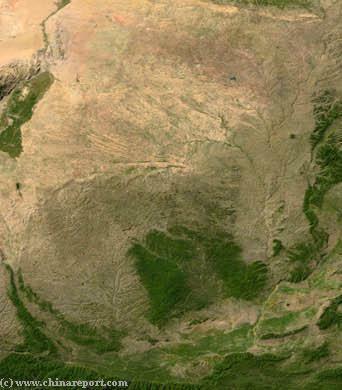 Satellite Image: overview of the Wei River Valley (Guanzhong Plain) of middle Shaanxi Province and its contrast with the arid northern loess plateaux. As described above, Shaanxi Province consists mainly of highlands, that either being the loess plateaux of the north or the mountains in the east and south. As a result, the temperatures in Shaanxi Province in general are lower than other locations in the North China Plain with the same latitude. Mainly the highlands and to a lesser extend the city of Xian itself know harsh winters and reasonably cool summers. The summer in Xian can be hot, but it still less exhausting than the summer in the inner city of Beijing. Winters in Shaanxi Province come relatively late as compared to the Inner Mongolia Autonomous Region and the National Capital of Beijing, however Xian is not unfamiliar with freezing temperatures and snowfall. The coldest month of the year in Shaanxi Province is January, in which the temeprature reaches -12 Celcius (10.4 Fahrenheit) on average across the north of the Province but a much more pleasant -2 Celcius (28.4 Fahrenheit) in the south of the Province. In the summers, temperatures range between 22 Celcius (71.6) up in the north and 27 Celcius (80.6 Fahrenheit) in the south which is not to say that there cannot be hot days or prolonged periods of temperatures well into the 30 degrees celcius. It is however a more pleasant environment than the suffocating heat of the city of Beijing, Shanghai and other metropolises across China. For this reason (and others) Xian remains a well visited city and tourist magnet virtually all year around, although naturally there are highpoints and low points to the season. 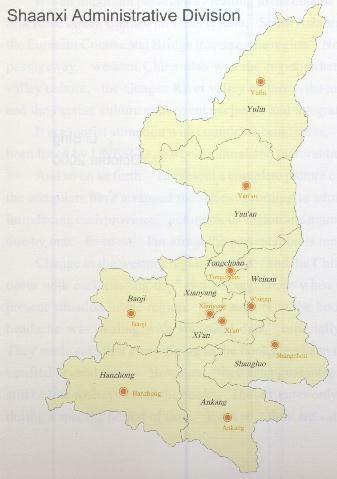 Shaanxi Province is sub-divided into 10 City Prefectures corresponding with the cities of the same name. The main Cities in the Province are: the Capital city of Xian and Xianyang, followed by Weinan, Baoji, Hanzhong and Ankang. Shangluo, Yulin, Yanan and Tongchuan complete sequence. 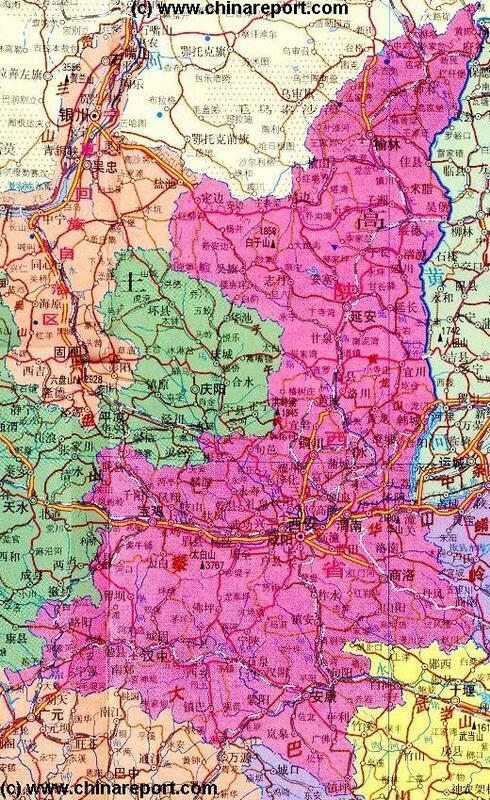 Cities can further be divided by location with Yulin and Yanan as the main cities in the northern Shanbei Region. In the Wei River valley of central Shaanxi Province the cities are from west to east Baoji, Xi'an and Weinan - with as additional the satellite city of the Capital identified as Xianyang. In the south Hanzhong, Ankang and Shangluo are the main population centers. The most visited city in the province is without a shadow of a doubt, the Capital of Xian whereas the other cities are far less traveled, especially by foreign visitors. Tourist who are interested in the Great Wall of China have to travel all the way up north to Yulin City and its outlying counties to get their fill and visit some of the most unique and renowned points along it. For Chinese internal tourism relating to the Chinese Civil War, Anti-Japanese War and the Chinese (Socialist) Revolution the city of Yanan is the main destination. Those who are interested in the Silk Road may travel up the Wei River valley from Xian to Baoji and onwards into Gansu Province. The cities of Hanzhong and Ankang are less renowned among foreign travelers and so offer a more relaxed off the beaten path itenerary. The lush green landscape of the south offers hidden scenic sights and considerable cultural treasures. Traditionally and historically, the economy of Shaanxi Province mainly depended on agriculture and trade, augmented with considerable influxes of Imperial Revenues during the highpoints of successive Dynasties with their Capitals at Xian or near. 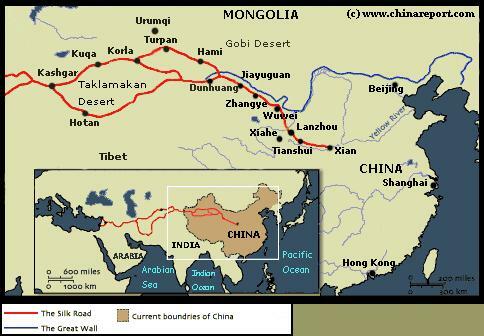 As may be noted, in the first millenium AD the Silk Road reached from the west to Chang'An subsequently making the city and surrounding regions the central point in a nationwide economy based on the export of silk and other specifically Chinese wares, in trade for jades, jewels, agricultural secrets, science, wisdom and more. There is no information available on the history of Shaanxi Province. (Hanshui) which among things gives its name to the city of Hanzhong but also flows through the city of Ankang in the south-east of the Province. The Xu River (Xushui) and the Hei River (Hei He ; not to be confused with the Hei River in Gansu Province and Inner Mongolia Autonomous Region) are among the secondary rivers of interest followed by a multitude of rivers and streams which cut through the more greener but also more mountainous landscape. A rare gem of the Shannan Region is the Upper Flow of the Han River, which offers a rare glance at a typical Chinese type Karst rock landscape which is however situated in unusually northern parts in Shannan of Shaanxi Province. Needless to say, apart from the more internationally known destinations the upper flow of the Han River is a regional tourist magnet which routinely draws in crowds, especially in the hot summer season. 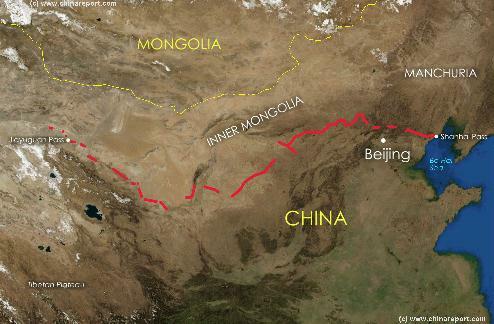 As explained, the Wei river valley, which sits just below the halfway line of the Province is usually taken as the divider between north- and south. The Wei River valley can therefor be taken as the third region of Shaanxi Province. Consisting of unusually flat lands, the Wei River is the most fertile part of Shaanxi Province and it is historically where most of the populace and the economy resided. Hence, this is where the ancient Capital of the Qin Dynasty (221 BC-206 BC), The Han Dynasties (206 BC-221 AD) and the Tang Dynasty (618 AD-907 AD) were situated. In fact, as one may find when studying the history of the Province in more detail, Xian, previously Chang An, was the proud Capital of the Chinese Nation no less than 13 times in history and therefor the Wei River valley holds some of the greatest historic treasures of China as well. Leading from Gansu Province into the west of Shaanxi Province the river flows through the city of Baoji and onwards to Xian on the way passing along various Mausolea of deceased Emperors and wives. At Xi'An the Wei River is joined by the Ba River (Ba He), a tributary which flows in from the south. Having past the ancient Imperial Capital and its many cultural treasures the Wei River forms the enormous agricultural flat lands of Weinan Prefecture in east Shaanxi Province before it terminates by meeting up with the great Yellow River. 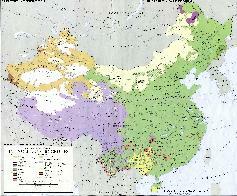 General schematic overview of the main Chinese Provinces and their rivers. In the north lies Shaanxi Province which is bordered by the Yellow River in the east and divided into a northern- and a southern half by the Wei River and its wide fertile valley. General schematic overview of Shaanxi Province showing the 10 City Prefectures sub-division. Click Red buttons to navigate through. It may be recognized that throughout the centuries and millennia the population pattern has shifted little within Shaanxi Province. As was the case in the past, the most people live in the fertile and central Wei River valley, mostly in the central and eastern parts. By far the largest city in Shaanxi Province is the Capital city of Xi'an. Today, after an influx of rural workers, a building boom and a migration of educated inland, the city counts some 8.7 million inhabitants and, as one might mention, an according smog problem. Xian is the only city with a subway / metro system within Shaanxi Province and is also has the main station for the nationwide high-speed railway system under development (This is Xian North Station (Xian Bei Zhan). It is a sprawling city with 6 train stations, 11 Districts and 2 rural counties. The second largest city in Shaanxi is the satellite city of Xian named Xianyang. Although, generally unknown to the wider world, the name of Xianyang is associated with the Capital of China's earliest Dynasty, the Qin. In Qin times, Xianyang was the proud and unsurpassed Capital of the first united Empire, today it is a bustling city which is mostly identified with the presence of various Han Dynasty Tombs and for the mainstream of travelers, the location of Xi'an Xianyang International Airport. Xianyang City and Prefecture counted some 4.9 million inhabitants in the year 2015. The Prefecture east adjacent Xi'an and Lintung District is Weinan, which by number counts more inhabitants, some 5.1 million in 2015, however the city of Weinan proper is by size markedly smaller than Xianyang City. Weinan City is thus the most populated rural Prefecture in the Province. Completing the pattern the 3rd largest city and 4th largest city prefecture by population is the city of Baoji, an important regional logistics node and ancient Chinese City along the Wei River and the ancient Silk Road. Outside of the main population centers and Cities of the Wei River the populace is almost equally divided between the north (Shanbei) and the South (Shannan). With a population of respectively, 3.35 and 2.2 million, Yulin and Yan'an are considered the main cities in the northern Shanbei Region. Tongchuan, with just over 830 thousand inhabitants is administratively counted as a city, however in daily practice the "city" is much overlooked as such. In the Wei River valley of central Shaanxi Province the cities are from west to east Baoji, Xi'an and Weinan - with as additional the satellite city of the Capital identified as Xianyang. In the south the largest city is Hanzhong which has around 3.4 million inhabitants. Ankang City on the lower Han River in Shaanxi with 2.6 and Shangluo with 2.3 million souls are the other main population centers of the south. Without doubt the main tourist highpoints of Shaanxi Province are all situated in or near the Capital of Xian and within the Wei River valley. That is however entirely seen from the perspective of international mass tourism. Many other smaller and larger historic landmarks, scenic sights and locations of historic improtance may be found throughout the province often hidden away in remote counties. Depending on taste, thus an entirely diferent tourist itenerary may exist for those interested in subjects such as the Silk Road, the Great Wall of China, the travels of the Monk Xuanzang during the Tang Dynasty, or for a more modern era entirely, to follow the path and traces of the Chinese Revolution. Main destinations for tourists and travelers in Shaanxi Province are best divided by location and region or by function. When Divided by region, the main focal point of traveling interest is in Xian and neighboring counties. This is the location of the most spectacular historic relics, most notably the City Walls, Great Goose and Small Goose Pagoda, former Palace of the Tang Dynasty and the ever lively Muslim Quarter within the city, and outside of it the magnificent Mausoleum of Qin Shi Huang, most represented by the Terracotta Warrior Army, and the various Tombs and Mausolea of the Han Dynasty Era in the area north of the Wei River in Xianyang City Prefecture. Another spectacular albeit slightly more remore tourist and cultural spectacular is the Hua Mountain (Hua Shan) found rising due south of the Hua Qing Hot springs and Imperial Palace. Renowned or notorious as the location of the "deadliest hike in the world", Hua Shan is the must visit destination for thrill seekers and adventure hikers in love with Chinese Mountain Temples. Far less visited are the northern three cities of Shaanxi Province, which however have history, scenery and locations of tourist interest in abundance. To travel about and seeing them all can however be a challenge due to the fact that the north is occupied by the loess plateaux of central China (Yellow River Basin) with the resulting eroded landscape consisting of steep hills and narrow ravines being notoriously difficult to traverse. Even today, with better roads and railways available, transportation between one location and another remains somewhat of a challenge. Mind you, the main revolutionary sites of Yanan City are are especially well visited during public holidays and revolutionary days of remembrance. The north of Shaanxi is by tradition a desperately poor, arid rural region which historically relied almost entirely on agriculture for its sustainance. With an encroaching desert and enduring water scarcity it is mostly a dust bowl. Among current day travelers it is most recognized for its fading but still interesting parts of the Great Wall of China, and also as the location of the former Communist revolutionary base from which Mao Zedong, Zhou Enlai and the Communist Party constructed their revolution for the nation entire. Far less well known to international travelers are the hidden historic treasures of Li Zhicheng✧s Palace, the home town and monument to Li the Great and other secluded wonders. No one travels to Tongchuan City for sightseeing. Although remote and mostly forgotten, the counties of Dingbian, Jingbian and Hengshan offer plenty to see and find for those who search. This includes spectacular conflagrations of the Great Wall of China as well as a multitude of hidden temples. Last and in this case indeed least, is the south of the Province which up to know is not frequently traveled by Foreign Visitors. Mainland Chinese visitors however know how to find and come appreciate the landscapes and wonder of the Han River (Han Shui) of which particularly the upper parts are identified as interesting to visit. 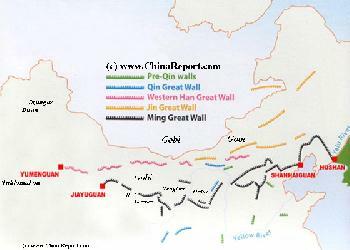 - Landmarks of Xian City and Area (Xian, Lintung, Xianyang). - Landmarks of Northern Shaanxi Province (Shanbei). - Landmarks of Southern Shaanxi (Shannan Region). 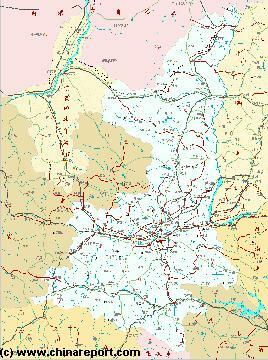 Or navigate Shaanxi Province by City or subject. In the 2nd millennium, the old Empire was more divided, and while the Ming Dynasty (1358 AD-1644 AD) once more reunited most of it, it also moved the National Capital moved far eastward to Nanjing City and later northward from there to Beijing. Finding only enemies in the territories of Central Asia in the Ming Era China turned to the sea for transportation, trade and economic development. But only for a little while. Although during the Yongle reign period great overseas diplomatic missions brought the Chinese Civilization to new highpoints, later Emperors made different decisions. China slowly turned inward and left without a functioning Silk Road fortified itself once again behind a Great Wall of China. As we know today, the wall of the Ming Era marked another highpoint of the civilization, that of Nationalism, narrow mindedness and return to traditional values. Meanwhile, no longer the location of the National Capital, the economy of Xian flagged and subsequently, almost the entire province returned to more proven old ways. Nevertheless, the old Capital strategically situated at the bottom of the Wei River always managed to retain its position as regional center of learning and trade, the driver of a regional economy and the gateway to more north-western cities in the hinterland. During the Qing Dynasty (1644 AD-1911 AD), the city of Xian retained this status and at the very end, in 1900 AD, it even regained some of its Imperial Glory, when during the Boxer War the Empress-Dowager Cixi with the captive Guangxu Emperor in tow, made their ways down for a brief stay at the Huaqing Imperial retreat of Lintung near Xian. As Wikipedia notes, in the midst of the 19th century, when Foreigners first had the opportunity to traverse the inner lands of the Chinese realm, animal skins, wine, liquor and musk. Although this report mostly reflects the limited knowledge of the foreign writer, with this it is shown that the great thriving economy of the silk road era no longer existed at that time. As we know from the stories told by China hands, missionaries and other travelers and workers , during the confusion of the warlord era, the anti-Japanese War and the building of the Shaanxi Revolutionary base, in most of the 20th century the economic situation was outright desperate and mass starvation's were not unusual. Those who did make it through the period remember widespread poverty, a lack of communications, the Japanese and Kuomintang economic blockades and most of all, a life of simplicity doing agricultural work in the many villages strewn across the loess plateaux. Nevertheless however, the city of Xian remained what it had always been, the ancient Provincial Capital and the all important conduit of traffic along the by then withered silk road and other regional roads leading in all directions. As the various traveling tales of now famous westerners in China underpin, anyone who wanted to be anywhere or go anywhere in the west just had to pass through Xian, which even at the worst of times was a glowing treasure of civilization in otherwise often destitute lands. As one may find, by then Xian had its own railway station adding to its importance as regional lay-over point but also solidifying its foundation of a base for regional logistics, manufacture and industry. In the second half of the 1930s, while a Communist Rebel Base led by Mao Zedong arose in the loess hills to the north and under duress of a full on Japanese Invasion which had intended to occupy the city, the ancient Capital burdened by refugees became a bustling hub of new developments. Among things, a branch of war industry spawned in the city, as it was one of the inland cities which still lay out of reach of the advancing Japanese Armies. Produces in Xian and nearby towns and areas, aid, supply and also ammunition was sent all over the north and north-east as part of the Kuomindang Republican effort to sustain the Nation under heavy assault. With the coming of the Peoples Republic of China in the 2nd half of the 20th century, the Chinese economy including that of Shaanxi Province, was transformed and industrialized. Building on its traditional strongpoints the city of Xian became a center of the Oil and Chemical industry, as well as other industries, helping the Nation transform from a largely agricultural base to a more modern industrialized status. Today, the Province is mainly noted for its high technology industry which includes the production of civilian type aircraft and a strong military component. This industry is mainly situated in Xian City neighboring Xianyang and surrounding areas. In support Xian has its own collection of Educational Institutes as does the city of Baoji. The other main industry in Shaanxi Province is the energy sector meaning coal, natural gas, oil and also Petrochemical industries. Famously, and notoriously, the northern Shanbei Region of the province has been found to be rich in coal, natural gas and oil. Especially in the recent two decades, while the nation went through an enormous economic boom the north of Shaanxi and with it the Capital of Xian flourished economically. Enormous amounts of coal were extracted from the regions of the loess plateaux bordering on the Inner Mongolia Autonomous Region, making the town of Daliuta (only miles across the border within Inner Mongolia) an important railway juncture as it is home to the largest coal mine and processing facility in the entire nation. New railroads were built to transport the coal to nearby industrial centers and factories in Xian and Xianyang but also to neighboring Provinces and territories notably the cities of Baotou in Inner Mongolia and Datong in northern Shanxi Province. In addition to the coal mining boom, the loess plateaux was heavily exploited for both oil and natural gas adding to the energy mix to be delivered to the fellow provinces and cities. Generally speaking, the economy of the province was transformed turning the traditionally poor north into the economic engine of the wider regions including the high end industries in Xian. As would however later be shown, the mining boom could not last and also had its considerable downside in environmental terms. Not only did the economic boom spawn rampant corruption among things turning the north into one of China's Mafia base area's, the drilling and mining also led to a further drainage of available ground waters in turn leaving agricultural villages in the Mu Us Desert areas with polluted or nearly unreachable sources of potable water. 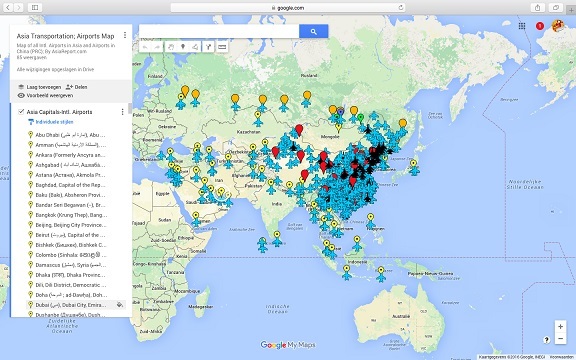 Another downside of modern development is the already mentioned high level of air pollution in the city of Xian and the Wei River Valley. In the current day Shaanxi Province is well underway with its transition process which aims to lessen economical dependence on fossil fuels and the associated heavy industries, while retaining economic vitality through its high tech industry. The new industries are involved in ICT, software creation, civil aviation, military aviation and also aerospace in defense. Xian is a major center of military rockets, military aircraft and vehicles as well as the modern electronics to support and use them on a modern battlefield. As an inheritance from the early years of the Chinese industrial revolution industries in- and around the city of Xian remain important in the production of light machinery, railway equipment, motorycles and engine parts. In addition, Xian and the surrounding region are noted as among the leading centers of science and development. The city of Xian alone has some 500 institutes involved with advanced research and development in a multitude of scientific fields and some 1000 of these are counted within the Province entire. Xian Institutes are noted in micro-electronics, bio-engineering, pharmaceuticals and software development. As an extension of the development of cities like Xian and a further strengthening of the economies of the inland provinces as planned by the Central Government under the marching banner "Go West Policy" the region of Xian and the Guanzhong plain are currently being developed as part of a triangle of cities which are to serve as economic engines for the wider western regions of the Peoples Republic. In the desired situation the city of Xian is to join its strengths with the cities of Chengdu and Chongqing in order to develop a base of high technology industries serving the west and the wider nation. Read more about the economy of Shaanxi Province in: "Economy of Shaanxi Province". Already during the lengthy reign of the Han Dynasty (206BC-221 AD) the first visitors from the west, at the time Roman Empire with its Capital in Rome arrived, illustrating just how the influence of Chinese Trade from Chang'An reached across the Eurasian continent. As they recorded, they found themselves among a flock of international visitors from many Nationalities. Many centuries later, during the highpoint of the Tang Dynasty (618 AD-907 AD) when Xi'An was once more the Capital, the city grew to over 1 million inhabitants, making it at the time one of the largest cities in the world and without a doubt the most important trading city in all of east Asia. And the silk road did not only deliver and exchange goods, it also exchanged idea's and cultures making Xi'An one of the most important Chinese centers of learning and intellect. When in the later period the Tang Capital was moved east to Luoyang for safety, decline set in, but only temporarily. 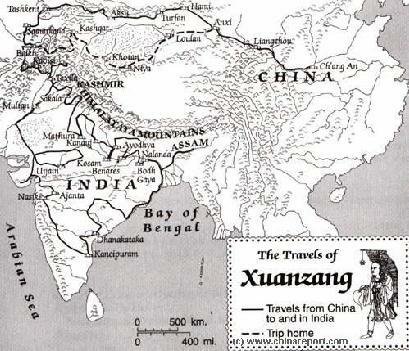 Helpful schematic map showing the position of Xian relative to the coastal cities, the current National Capital and the ancient silk road extending from Xian westwards into the west and Central Asia beyond. The basics of transportation within Shaanxi Province are easily understood. That is, as with other Provinces of the Peoples Republic of China, transportation is divided between the three main branches of public transportation; air travel, railroads and roads and highways. On a more regional and local level public transportation consists of the railroads and highways, supported by regional long distance bus lines. At the local level one may find subways in modern day cities, in case of Shaanxi Province only in the city of Xian. In principle in all other Chinese cities and towns there are bus- and trolley lines, local electric trams, low cost shuttle buses ferrying folk to regional destinations such as neighboring towns and of course the local bus and taxi. Thus explained the general situation of public transport for all of China. Described in more detail below are the specifics for Shaanxi Province and the main tourist and travel destinations within. Notably, Shaanxi Province currently has 6 civilian airports with among them the Xian Xianyang Airport by far the largest. The High-Speed Railway system is still under construction across China and currently only the cities of Baoji, Xianyang, Xian and Weinan are inclued in the system (with minor stops in between). The average annual precipitation in Shaanxi is between 350mm and 700 mm of which most falls in the summer months. As may be deduced from this, this means that snowfall is fairly rare in winter. Recently the most pressing climatic woe relating to the city of Xian, but almost equally to other cities across the North China Plain, is the main-made problem of air pollution. Mind you, the problem is not just air pollution, but pollution to the level qualified as extremely hazardous. In recent years, the phenomenon which usually involves a multitude of cities and often more than a few provinces, this level of air inquality has been popularly dubbed "airpocalypse". Best advise for travelers is to download the proper apps to your telephone or through other channels keep an eye on the pollution levels. These are worst in the Wei River valley around Xian City. In addition, before worrying about sun lotion or shades, make sure to be in posession of a mouth cap or even gas mask to be available when need be. Other helpful climatic traveling advise may be to note that up on the loess plateaux of the north the air is much drier than in the center and especially south of the Province. The south sees more rainfall than the north. As distances and challenges may vary according to your planned itenerary, make sure to wear appropriate shoes.